What Fruits Can Hermit Crabs Eat? What Fruits Do Hermit Crabs Eat? Zebra Sunset Land Hermit Crab. Out in the wild, hermit crabs are not fussy eaters. They eat a wide variety of foods including decaying wood, fallen fruit, leaf litter, plants, grasses, and meat. Hermit crabs are omnivores and will eat almost anything. Hermit crabs are able to find their food in two ways: by smelling the food and by seeing other hermit crabs eating. You can observe a hermit crab's sense of smell at home—place two food options in their habitat, one smelly and one not. They will likely come out of their shell, wiggle their antennae and head straight to the smellier food item. Like humans, hermit crabs thrive on a very varied diet. When feeding your hermit crab, focus on natural, healthy foods and eliminate processed foods from their diet. Feel free to include vegetables, meat, fish, nuts, and fresh fruit in their daily diet. You can literally feed your hermit crab food straight from your refrigerator. Make sure any produce is washed and dried, thus removing any pesticides that might have been on the food. Hermit crabs thrive when their diet includes calcium, carotene, and antioxidants. 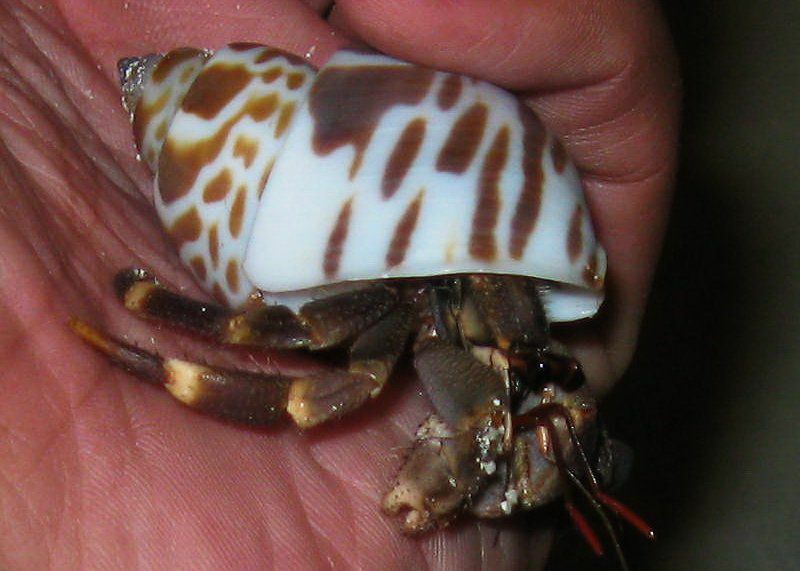 If a hermit crab is deficient in carotene, the hermit crab's color will fade after molting from a bright reddish/orange color to a faded-out tan or gray. Carotene can be found in brightly-colored vegetables like corn and carrot, which are both healthy additions to a hermit crab diet. The size of the food doesn't really matter for hermit crabs. Do not feel obligated to cut up the food into bite-sized pieces. Your hermit crab will leisurely eat the food you have served and will take their own bites. Hermit crabs are omnivores and may also enjoy picking the meat off the bone. Just be sure that there is no butter or any other sauce on the meat, as this is not healthy for the hermit crab. Food can be placed directly in the cage or in a flat bowl or plate, with easy access for the hermit crab. In addition to food, all hermit crabs need access to both fresh and saltwater. The hermit crabs need the fresh water for drinking and most hermit crabs will also drink the saltwater and use it for bathing. Do not use tap water without treating it with a dechlorinating product. Most pet stores sell dechlorinating drops, which removes any harmful chlorine from the tap water. Also, do not use table salt to prepare the saltwater. A product like Instant Ocean imitates natural saltwater and is the best option. Two water bowls should be in the habitat at all times—one for fresh water and one for saltwater. As always, be sure to speak with your veterinarian or local pet store to discuss the best options to care for, feed, and house your pet hermit crab.